The European Flag or Flag of Europe is used by the European Union and the Council of Europe. The flag of Europe has been in use since 1955. The European Union flag is distinctive with its twelve golden stars set on an azure blue field. The flag’s design was approved and adopted by the Council of Europe (CoE) in the year 1955 and has since been a symbol representing Europe as a whole. The council encouraged other European organizations to adopt it, and this saw the European Communities (EC) take it up in 1985. 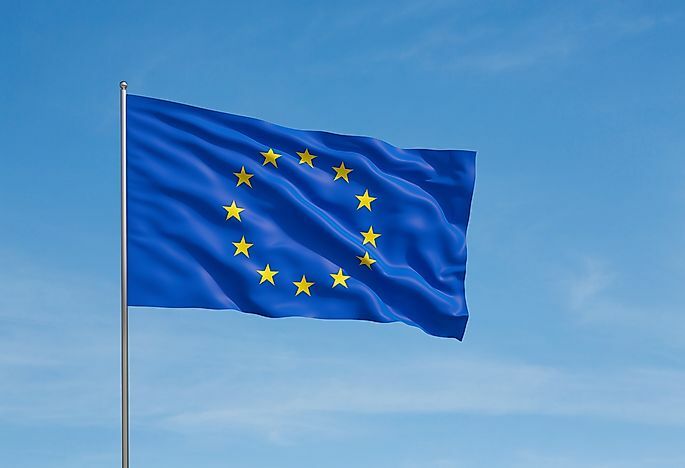 The European Union (EU), upon formation in 1993, inherited the flag and its uses from the EC. Presently, the flag is widely used in official activities of the EU as well as the Council of Europe. The European Union flag was designed in 1950, but it was not until 1955 that the council adopted it as an official emblem. The European Parliament also adopted it in 1983 and finally it was adopted as an official ‘emblem’ for the European Communities (EC) in 1985. The status of the flag in the EC was taken up the European Union when it was formed as a successor of the EC. Although the flag is employed for numerous official activities of the EU, it has never been accorded official standing in any EU’s treaties. Plans were underway to officially adopt the flag as part of the union’s primary symbols, but these plans failed when the European Constitution was not ratified in 2005. The European Parliament, in 2007, officially embraced the flag for its use. The European flag is an official emblem of both the Council of Europe as well as the European Union and holds varied official uses in the different member states. The EU emblem is depicted on euro coins and banknotes. Vehicle registration plates as well as driver’s licenses that are issued in the Union spot this emblem as well. Logos that are employed by EU bodies, institutions and agencies are derivatives of the EU flag. In a majority of member states, the flag is not legally regulated and is often subject to ad hoc revision. However, there are some member states such as Italy where the flag is regulated by legislation and must be used together with the national flag. In such cases, the national flag takes antecedence over the European flag. According to the symbolic description from the Council of Europe upon adoption of the flag, the flag is the primarily symbol of unity. The azure blue field represents the sky, and the golden stars represent the people of Europe. The circle that is formed by the stars is a symbol of unity. The number of stars is often mistaken to represent the number of member states when the Maastricht Treaty was signed. However, the number of 12 was incorporated into the design as a symbol of perfection and completeness. The design of the EU flag has been used in different variations, for instance, the Western European Union flag uses similar colors and stars. The difference between the two is that the stars are based on membership and are set in a semicircle instead of a full circle. The flags of Kosovo and Bosnia and Herzegovina also draw inspiration from the European Union flag. Brussels is regarded as the unofficial seat of the EU. The flag of Brussels-Capital region bears similarities to the European Union flag. Where Is The Headquarters Of The European Union (EU) Located?